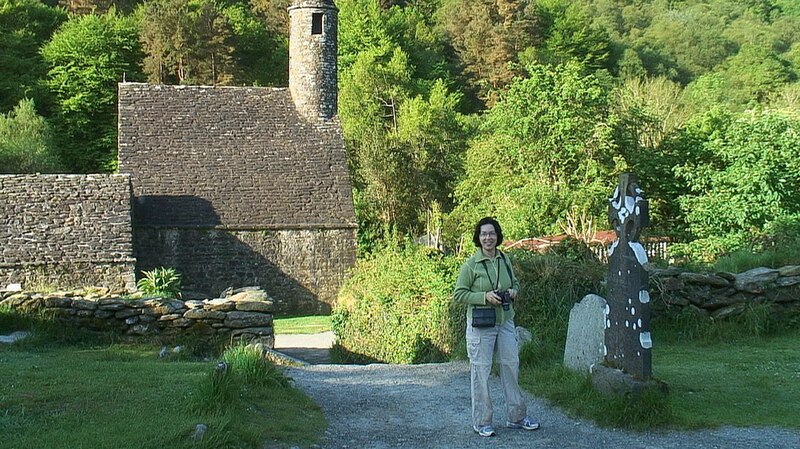 Bob and I had wanted to visit Ireland and visit the Valley of the two lakes at Glendalough in County Wicklow, Ireland, for many a long year. 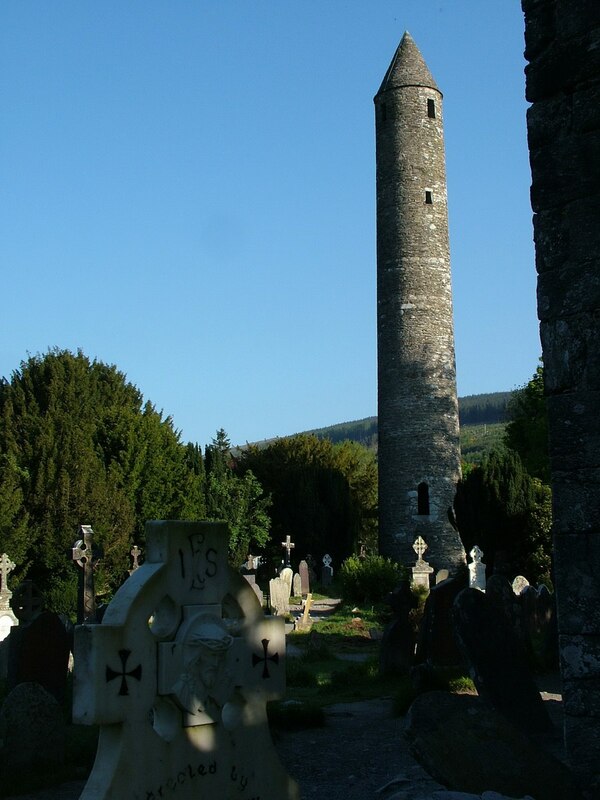 So finally, we booked a flight and made for Dublin , and Glendalough. We were excited about exploring the land of Bob’s ancestors. The Emerald Isle, as Ireland is fondly called, had me envisioning rolling hills burgeoning with lush green vegetation, and sprawling masses of shamrocks in shady glens. Our destination for the first night on the ground was Glendalough in County Wicklow. 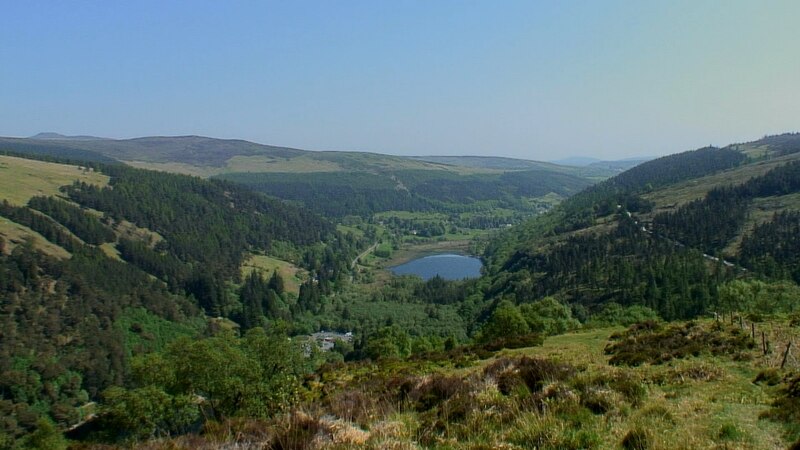 The village of Glendalough is situated in Wicklow Mountains National Park in what is known as the “valley of the two lakes”. Arriving safely in Glendalough required constant attention when traveling on the narrow carriageways since we had to drive on the left-hand side of the road unlike our customary practice here in Canada. Together with sharp 90-degree and 120-degree corners, cyclists and riders on horseback sharing the tarmac, and ancient stone walls within an arm’s reach of the car window, the experience was harrowing for those unaccustomed to the conditions. 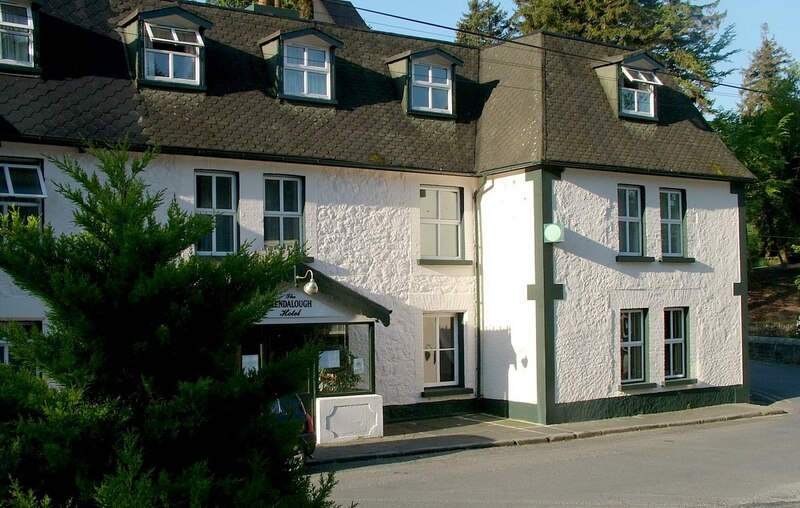 The Glendalough Hotel, which came highly recommended, is an old, well-established hotel set at the edge of a river and within sight of the Wicklow Mountains. 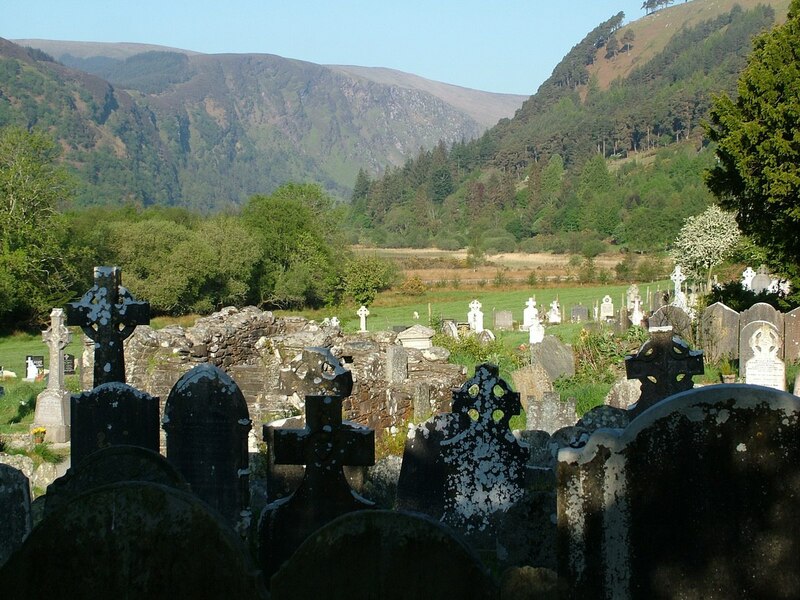 Glendalough has long been an area renowned for its natural beauty and history, and it is one of the most visited places in Ireland. 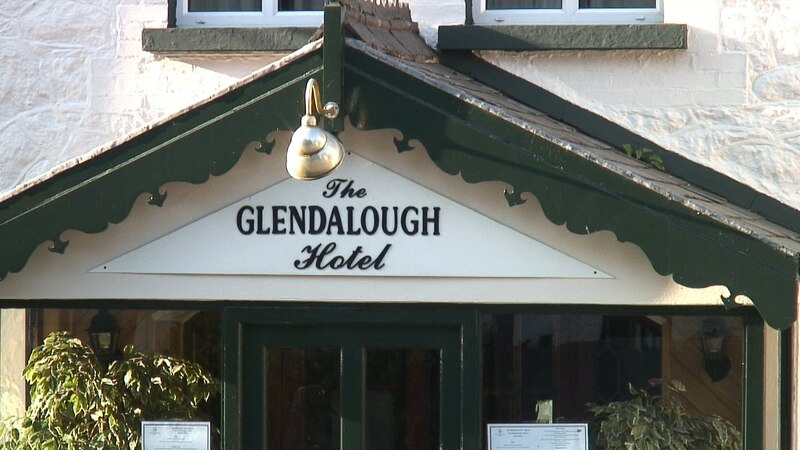 One section of The Glendalough Hotel actually spans the Glenealo River and sits right next to an ancient stone bridge. 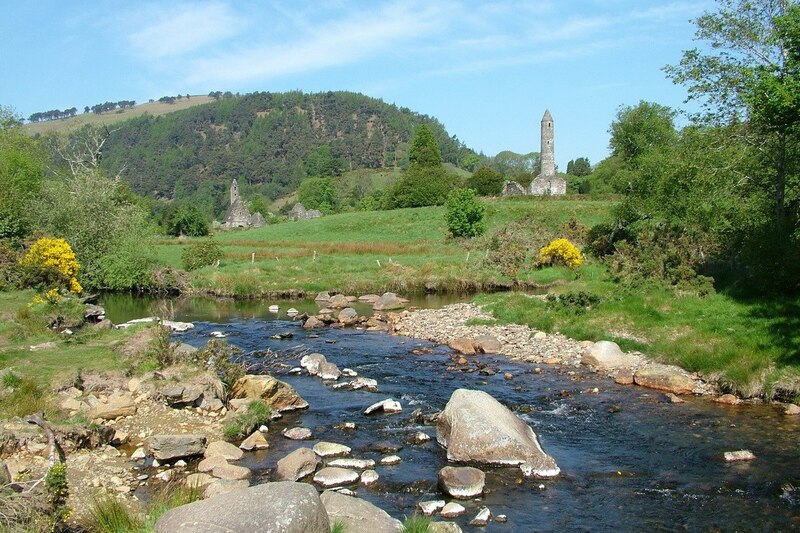 On the opposite side of the river rests the early medieval monastic settlement for which Glendalough is renowned. It was very early in the morning when Bob and I strolled across the twin-span bridge in order to gain access to the ancient monastery. We were the only two people out and about at such an early hour, but already, a soft veil of sunshine cast long shadows through the neighboring trees, while doves cooed plaintively in the cool shade of the hotel’s alcoves. 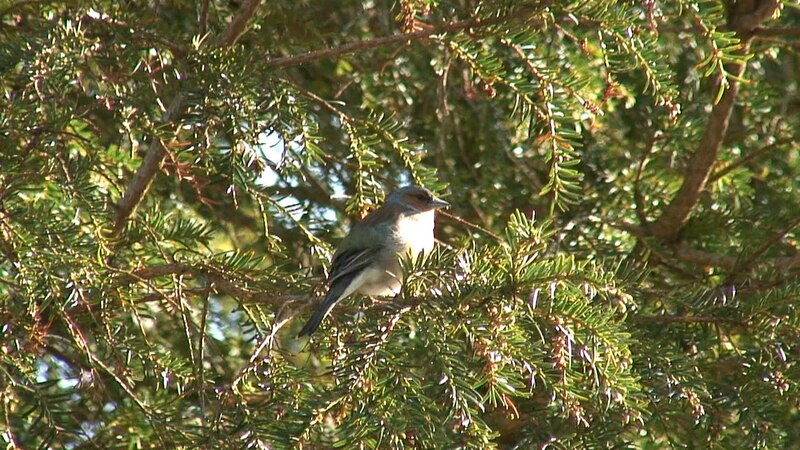 Wings fluttered in the trees nearby, and Bob and I soon spotted a female Common Chaffinch at rest on the bough of an evergreen tree. 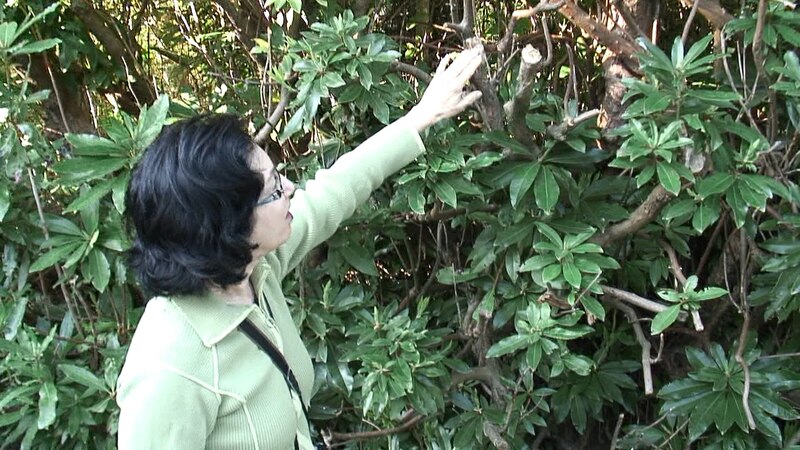 Always one to stop and admire interesting plants and flowers, I was drawn to a very old and well-established rhododendron just outside the gatehouse that marked the entrance to the site of the monastic retreat. It must have been growing there for many scores of years judging by the size of its main trunk and branches. They were very substantial! 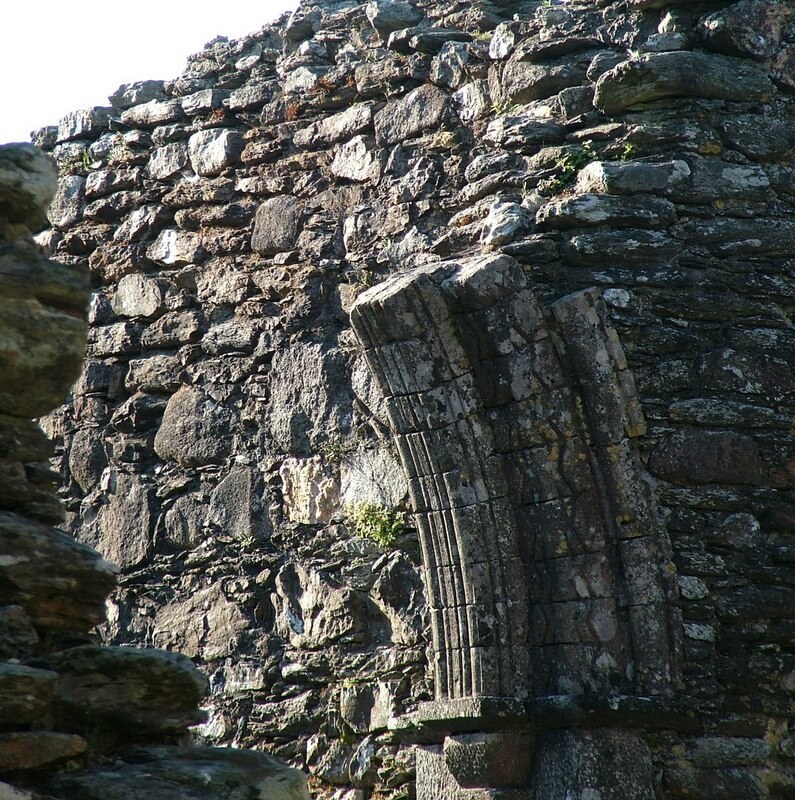 Guiding us into the ancient monastic enclosure were the double stone arches of the original gatehouse. 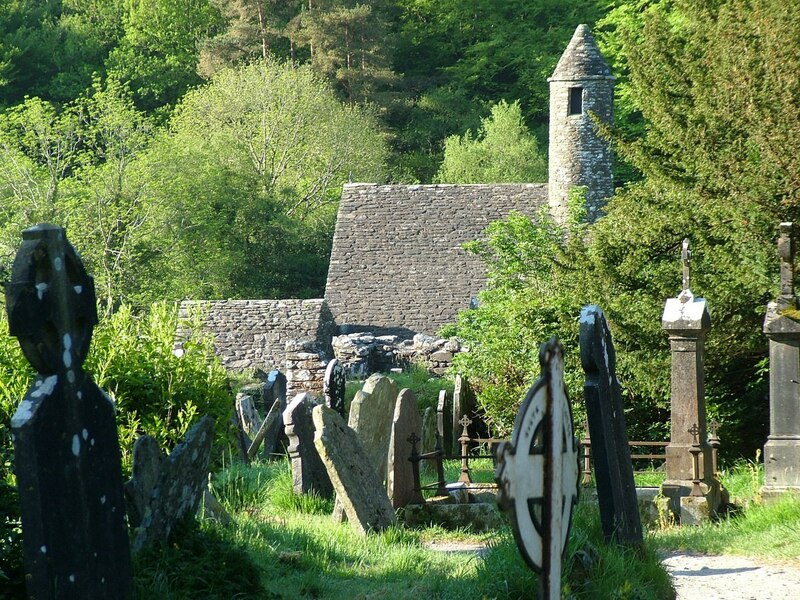 The Gateway to the monastic city of Glendalough is one of the most important monuments, now totally unique in Ireland. It was originally two-storeyed with two fine, granite arches. It is believed that, at one time, The Gateway had a timber roof and was a sanctuary in and of itself owing to the cross inscribed in a stone on the west wall. 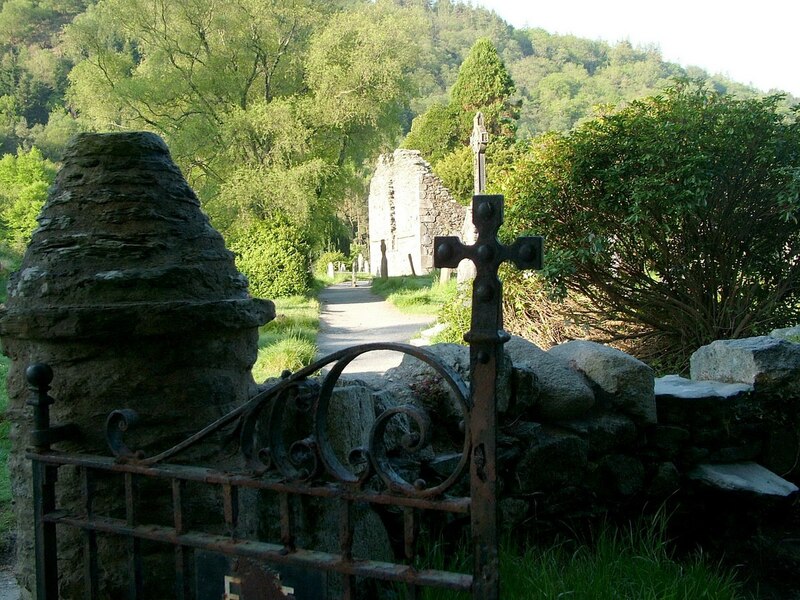 A sturdy wrought iron gate decoratively fashioned with a Celtic cross and curlicues marked the entrance to the graveyard. Bob and I tentatively and respectfully crossed the threshold. At center stage in amongst the headstones stands a roofless cathedral dating from the 12th century. It is the valley’s largest ruin. 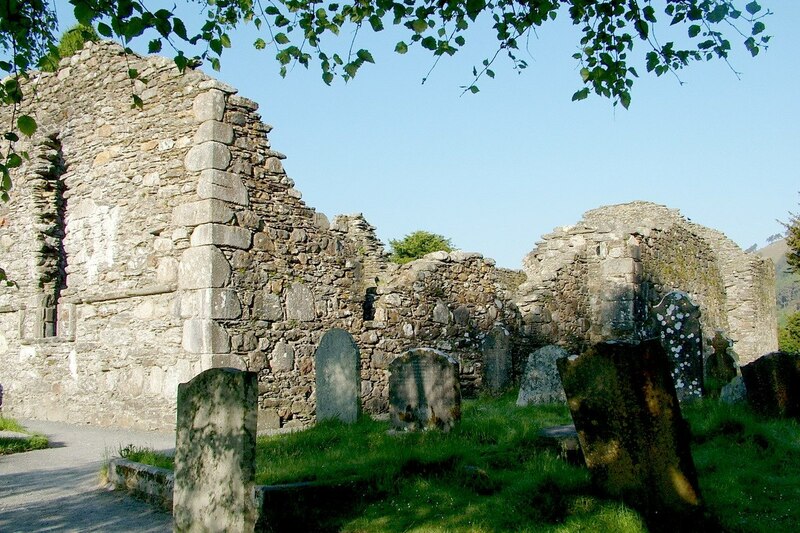 That imposing structure has undergone several phases of construction over the centuries, and at one point, mica-shist stones from an earlier, smaller church were used for part of the walls. 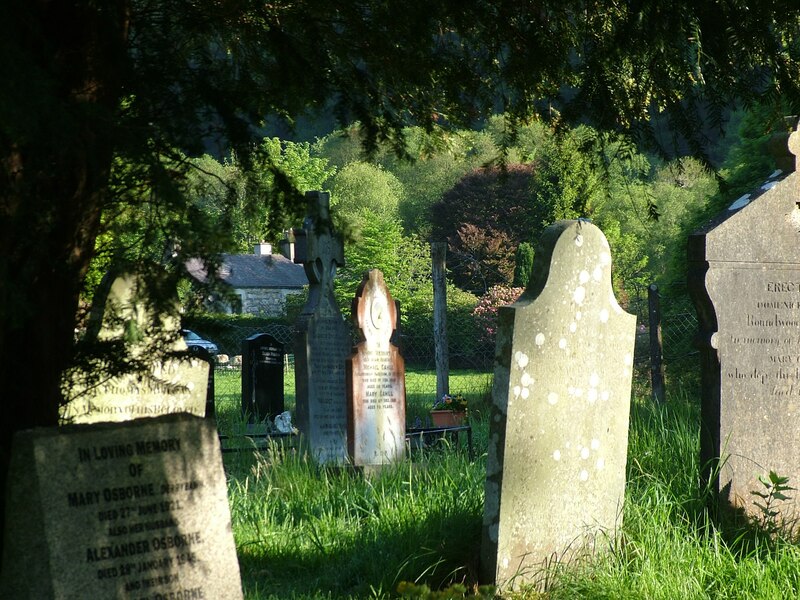 In the soft shadows of a shade tree, primitive headstones marked centuries-old graves. Standing askew amidst the long grass, they have withstood the test of time. This was no small feat considering the numerous raids on the settlement over the centuries. 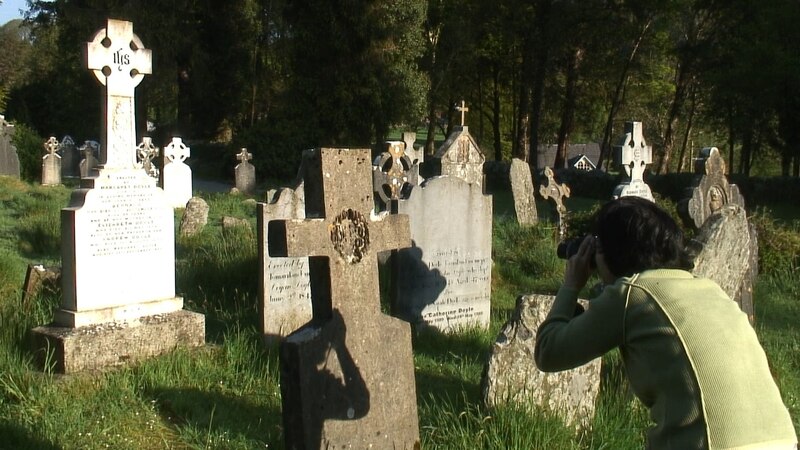 Bob and I were eerily reflective meandering amongst the ancient headstones with only the rooks watching over us. 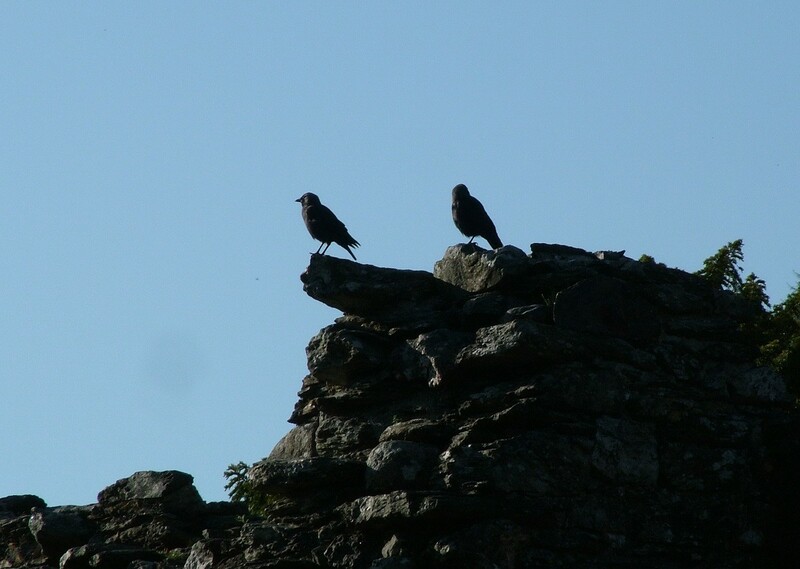 It has been said that each rook you see embodies the spirit of a long-lost person. 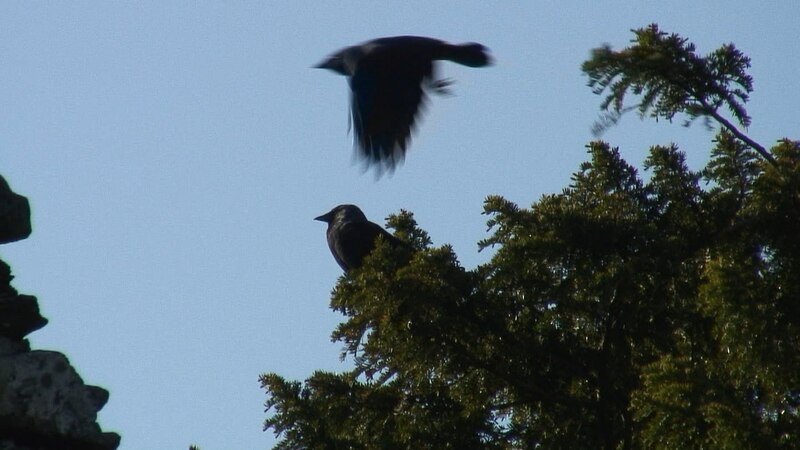 Numerous rooks surveyed the graveyard from on-high, which seemed very apropos. 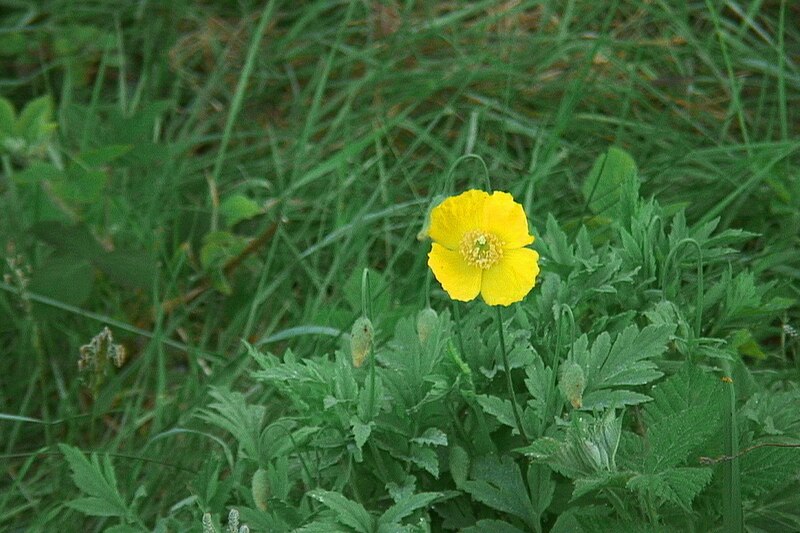 One lone poppy brightened the lush green spring growth in the cemetery. The Round Tower with its conical roof stands about 30 metres high, and oddly enough, the entrance is about 3.5 metres from the base. Round towers were originally built as bell towers, but their primary purpose was to serve as landmarks for approaching visitors. They also served as storehouses and occasionally places of refuge in times of attack. I imagine this one harbored fugitives frequently. Here, the Round Tower can be seen through a gap in the Cathedral wall. The four storeys above the entrance level of the Round Tower are each lit by a small window, while the top storey has four windows, one facing each of north, south, east and west. I became very contemplative when surrounded by such aging artifacts as this intricately decorated cross. 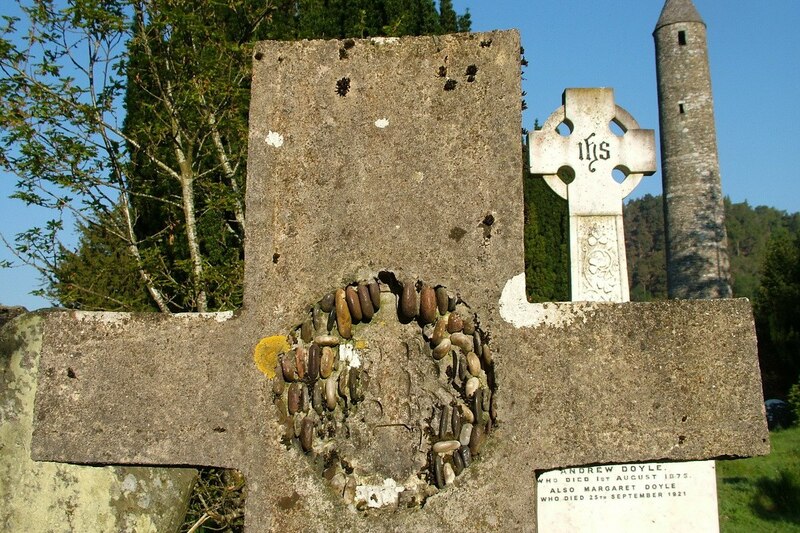 Stories of past historical events haunted our thoughts as we strolled between the stalwart tombstones, reading barely legible inscriptions on many of them. Here, we see St. Kevin’s Church at the center of the area of refuge. 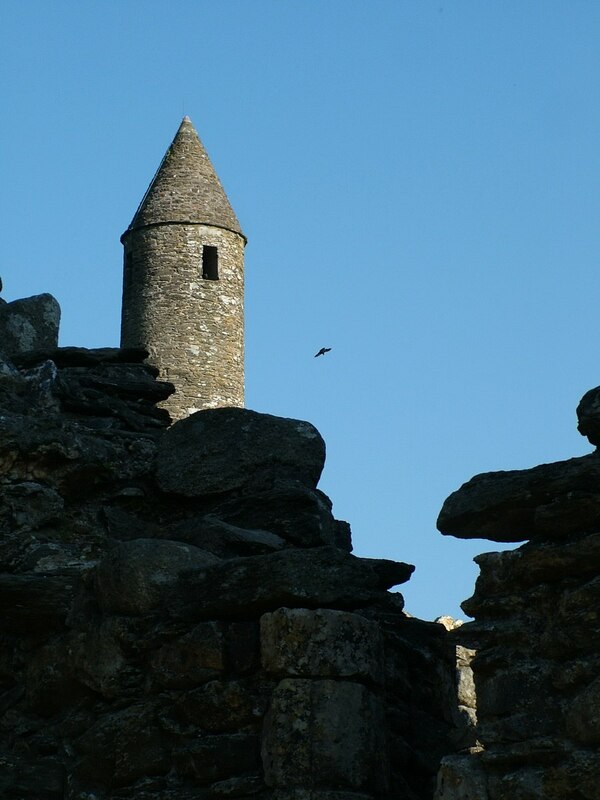 Kevin was the Irish saint who was known as the founder and first abbot of the monastic retreat there at Glendalough. 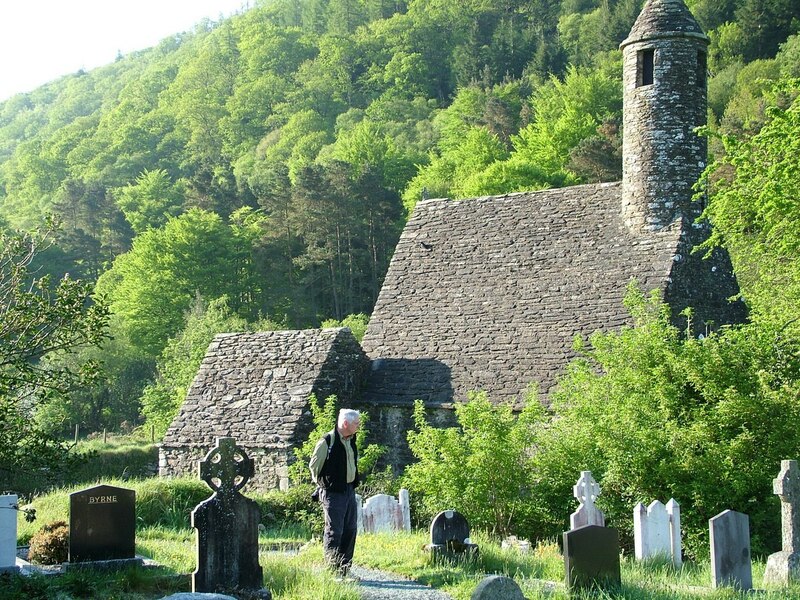 As a child, Kevin studied under the care of three holy men, and it was at that time that he went to Glendalough and lived, we were told, “in the hollow of a tree”. 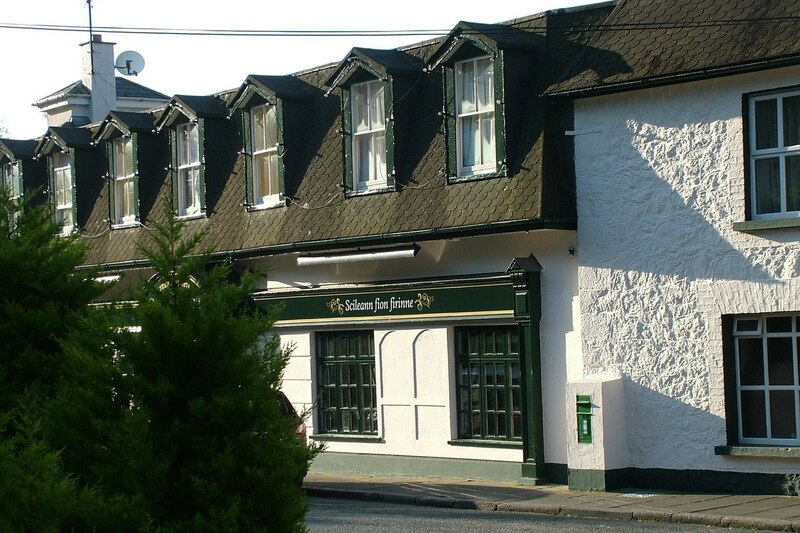 Bob soberly contemplated the origins of the village and the lives of the people who once lived there. Kevin returned later, with a small group of monks, to found the monastery where, as he put it, “the two clear rivers form a confluence” in the valley of the two lakes. Before the arrival of St. Kevin, that glen would have been desolate and remote. No wonder that it appealed to Kevin for a secluded retreat. St. Kevin’s fame as a teacher and holy man spread far and wide and had many people coming to seek his help and guidance. 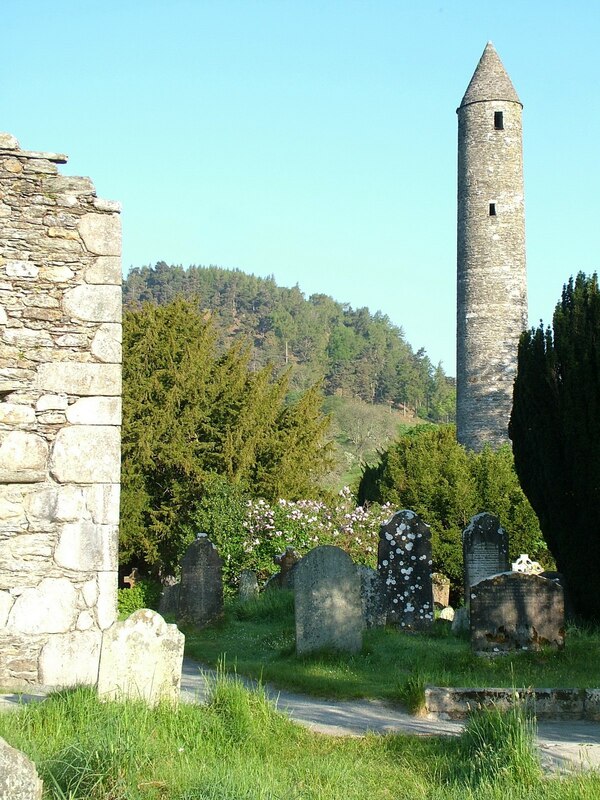 Over time, Glendalough grew into a renowned seminary of saints and scholars and the parent of several other monasteries. 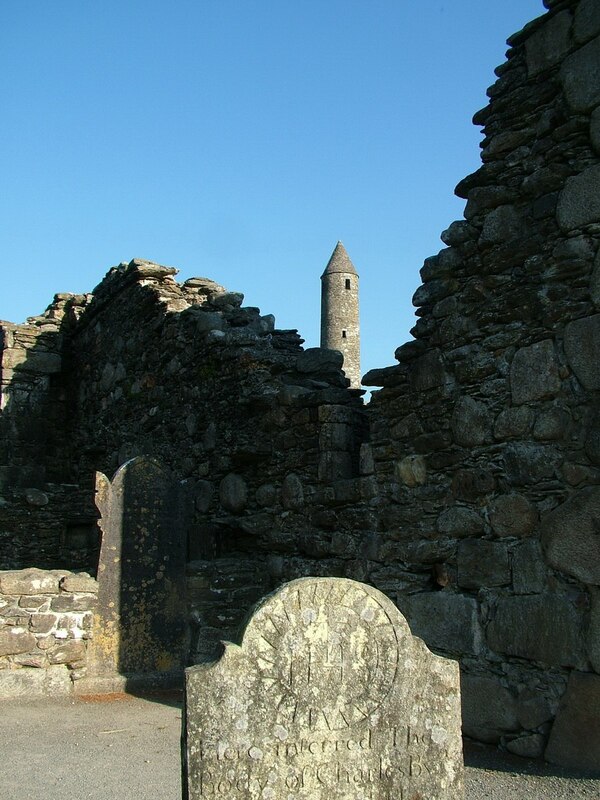 St. Kevin’s Church was alternately referred to as “the kitchen” since the belfry on top of the roof has the appearance of a chimney on an old-fashioned stove. The steep roof is formed of overlapping stones. 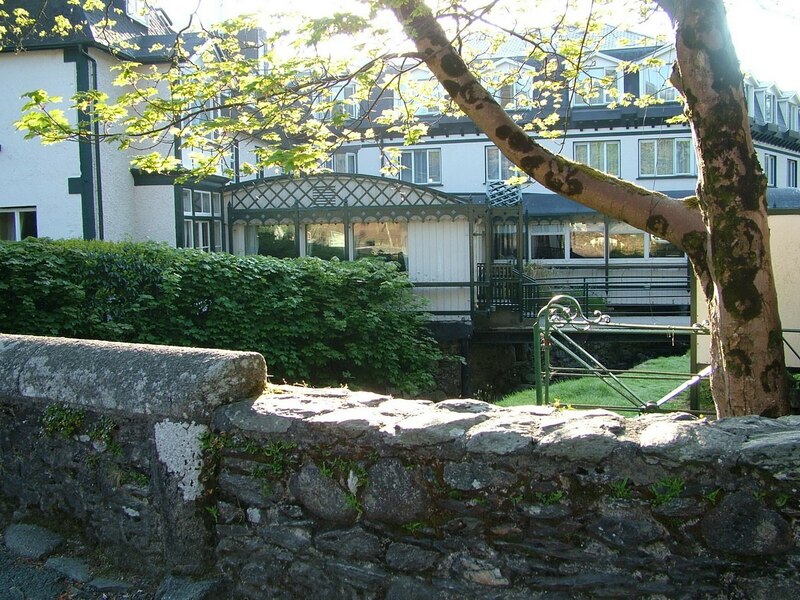 Bob and I meandered the grounds for at least an hour before breakfast, all the while reflecting on the past history of this charming glen and religious retreat. Overnight, heavy dew had soaked the long grasses of the meadow, and these were slowly drying under the warm rays of the sun while plaintive baaing of sheep in a nearby field added to the peacefulness of the setting. 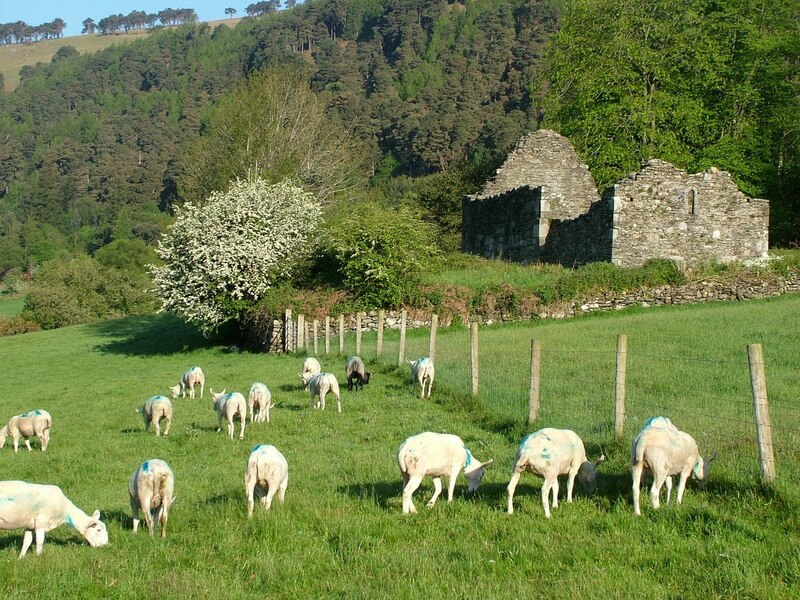 Nestled there, at the base of the Wicklow Mountains, the glen provided an idyllic, scenic and private area for St. Kevin’s monastery. 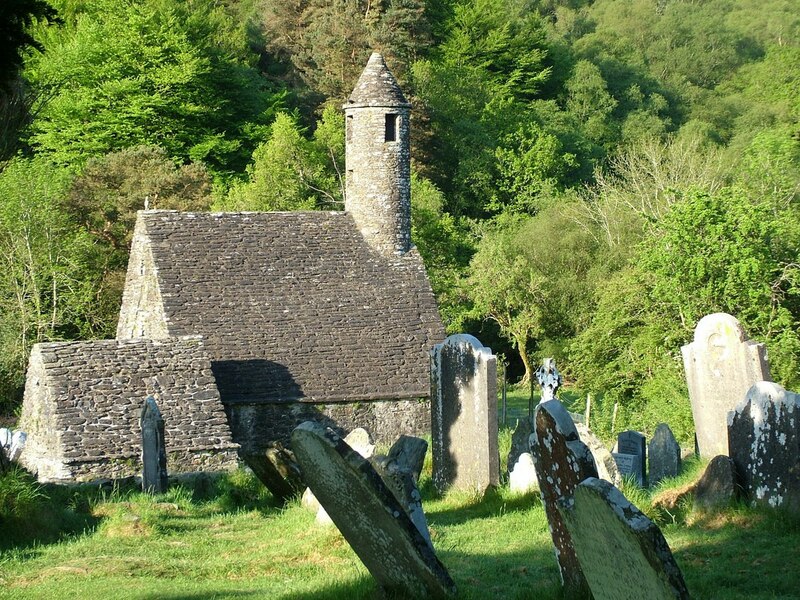 Having firmly established his community, St. Kevin retired into solitude for four years, and only returned to Glendalough at the earnest entreaty of his monks. 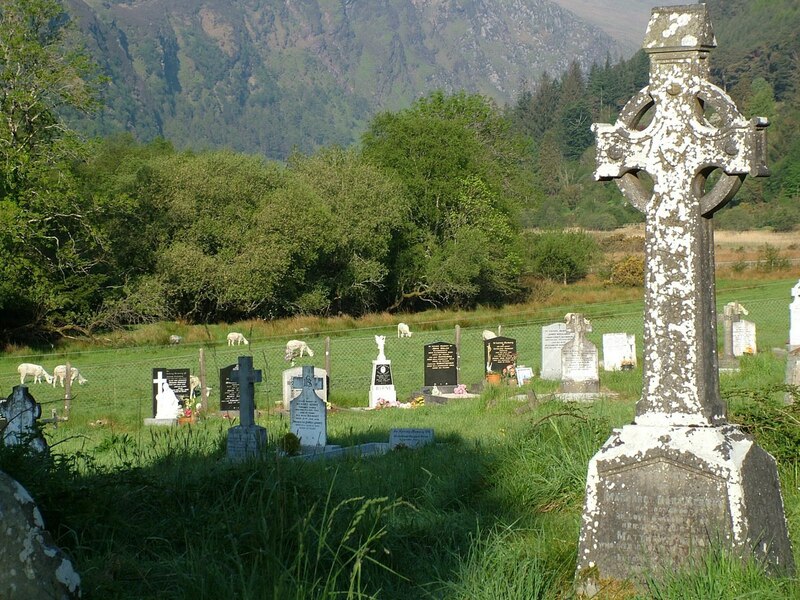 Until his death around 618, Kevin presided over his monastery in Glendalough, living his life by fasting, praying and teaching. St Kevin is one of the patron saints of the diocese of Dublin. Hi Brenda. 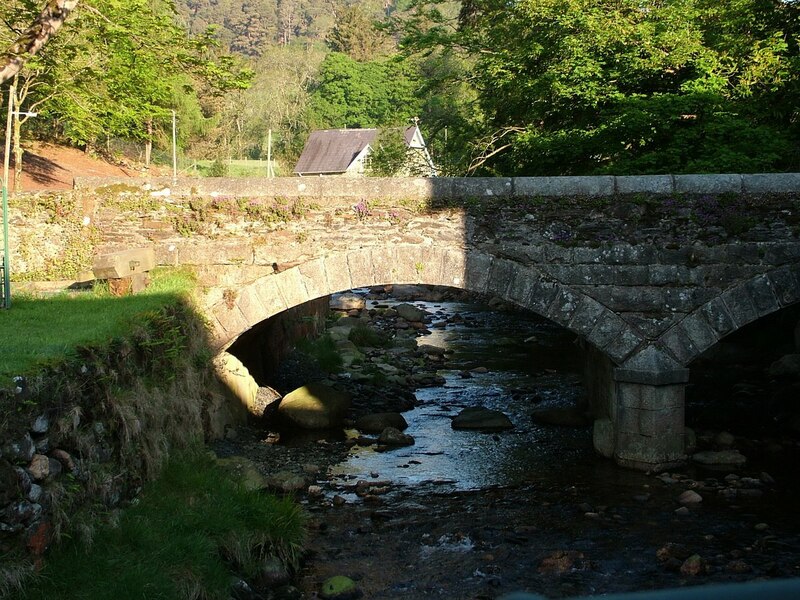 I am glad that you appreciated our blog about Glendalough. We did have a wonderful vacation in Ireland, and in doing our blog, we relive many of the experiences and places that we visited. It makes us want to return soon.